Team sport weathervanes are popular with schools, stadiums, clubs and training facilities as well as with the participants themselves. 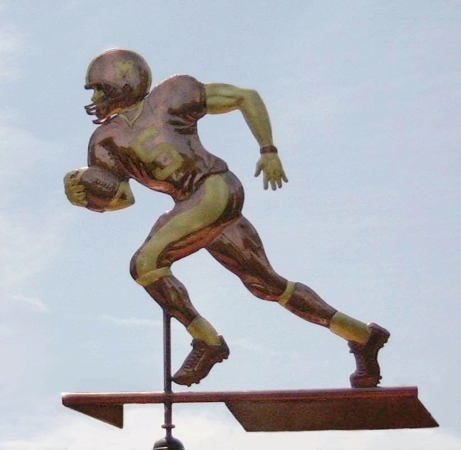 Whether your passion is baseball, football, soccer, hockey, cricket, tennis, competitive cycling, sailing, one of the many equestrian sports or a sport we have not yet tackled, we can create a weathervane to reflect your passion. Click on the thumbnails below to get an in depth view of some of our designs and how they came to be. We are in the process of adding all 800 existing weathervane designs to our site. Rest assured that if you don’t see an old favorite here yet, we still have it! Just give us a call 831.425.5505 for details.